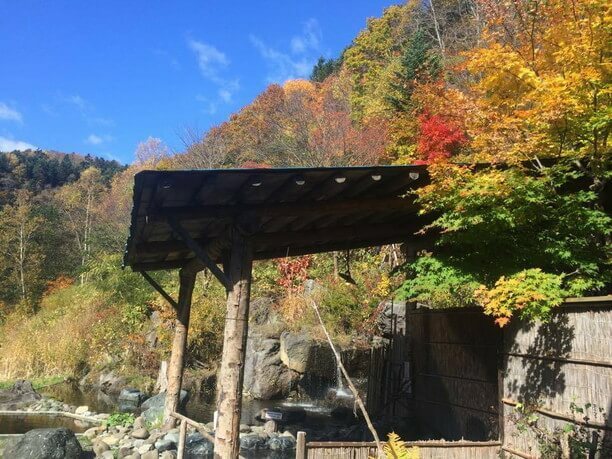 Kaitaku Fukurofu no Yu hot springs is located in Ishikari County’s Toubetsu town which is about one hour north of Sapporo by car. 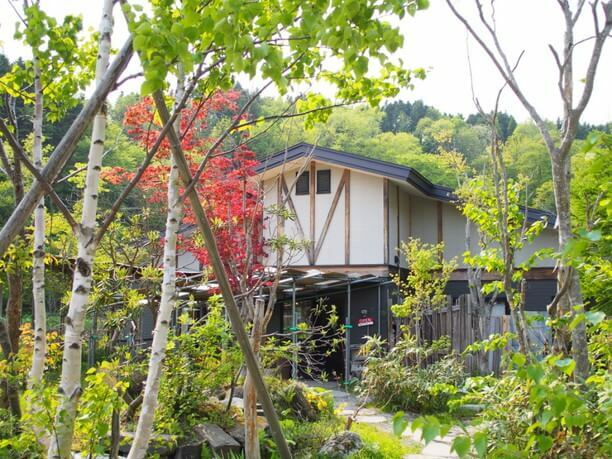 It is a small day-trip hot spring facility located in a peaceful place where the rural scenery of the Ishikari plain spreads out before you. Despite not having the most convenient location a lot of people will come just after they open most weekdays. 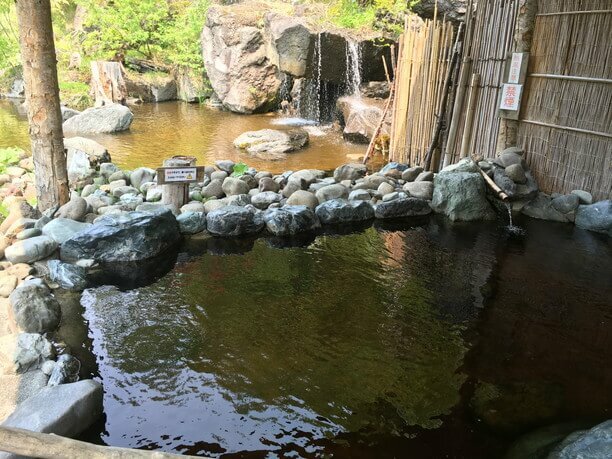 It is said that people who bathe here even once will definitely become a fan of this hot spring. 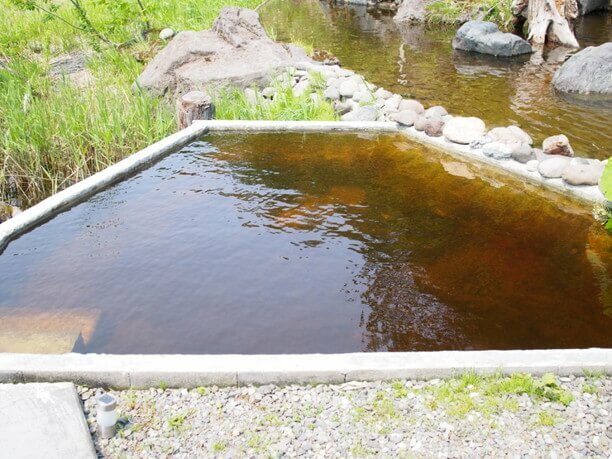 One of the reasons for its popularity is the good quality of springs that is highly acclaimed by well-known hot spring critics. 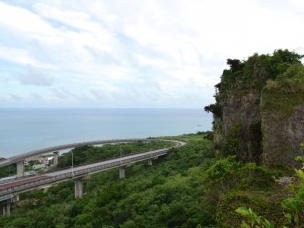 The second reason is the wonderful view of nature from the open-air bath. The word of mouth advertising is causing the number of fans to increase rapidly. 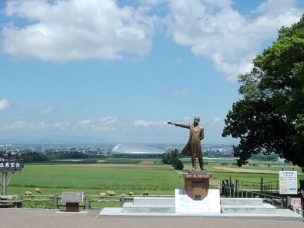 Kaitaku Fukurofu no Yu is located about 5 minutes on foot from the uninhabited JR Ishikari Kanazawa Station. After walking for a while with the station behind you will see the building. When you enter, a gentle man will greet you. Mr. Noriyasu Takano(高野紀康) is the one who cares for Kaitaku Fukurofu no Yu. 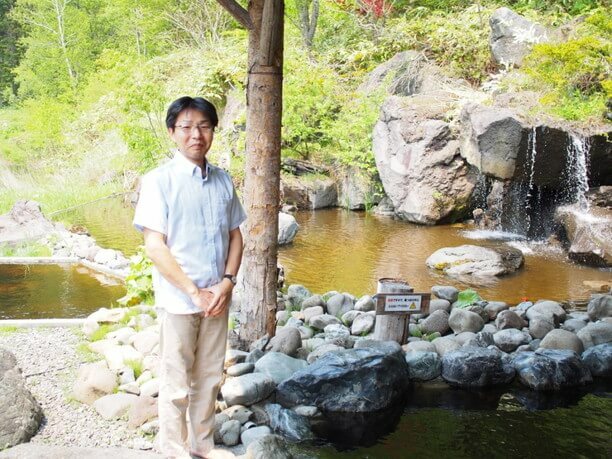 Mr. Takano is also very famous as a hot spring expert. He has 5 hot spring qualifications, including hot spring sommelier master and hot spring bath instructor! Originally, Mr. Takano who was an ordinary office worker, but he liked hot springs and changed jobs to work at a hot spring hotel. After that, he created a bond with this Kaitaku Fukurofu no Yu and decided to take over from the former owner. He handles everything from customer service to management of the hot water, and cleaning. 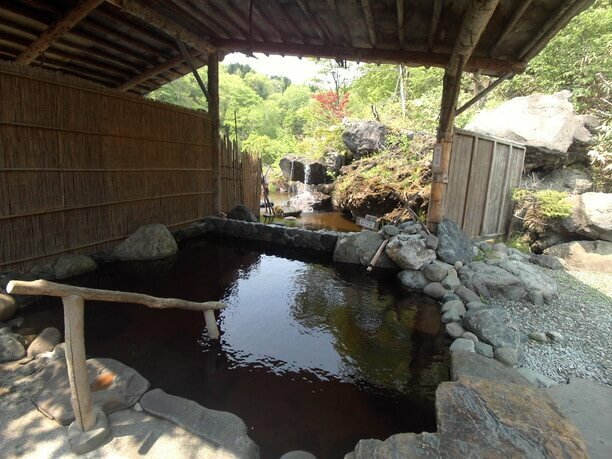 Kaitaku Fukurofu no Yu has two inside baths and one outdoor bath that are used by men and women on opposite days. 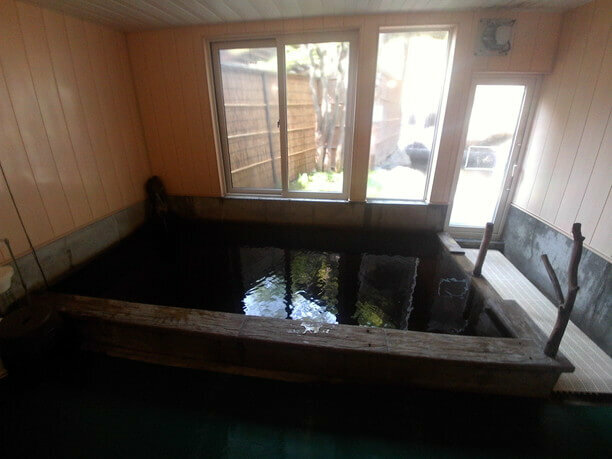 The inner bath is small, but there is a feeling of cleanliness. There is soap in the washing room and amazing dark brown hot water that is overflowing from the bathtub. The Hot springs is a sodium-chloride · hydrogen carbonate hot spring that contains sodium bicarbonate salt. 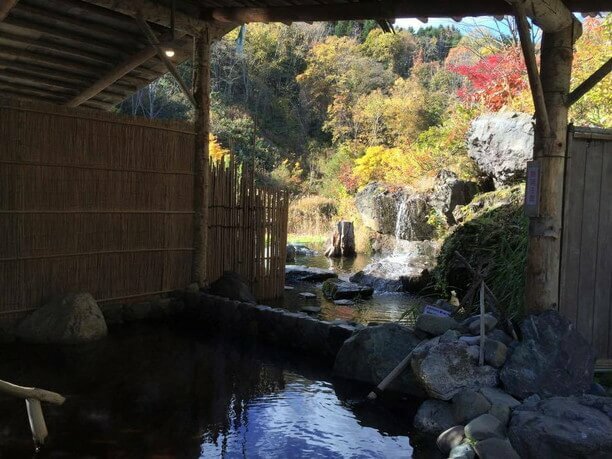 Takano says, “When expressing the features of this hot spring in a word, it is “kind” water. One of the reasons is the water is Alkaline with a PH of 8.6. It makes the skin slippery similiar to the effect of soap. Also the baking soda type ingredient will condition the skin. The outdoor bath is a beautiful garden space! The outdoor bath is warmed by the inner bath. From the open-air bath on the left you can see a big pond. The temperature of the outdoor bath is intentionally set as low as 102 F. The setting of the inner bath is about 105.8F. 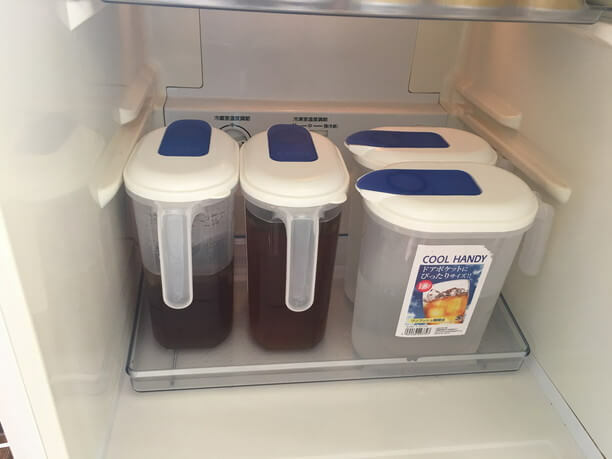 There is also a small bathtub on the left side, which has not been warmed and stays about 77F. It’s awesome in the summer. You can see mountains and waterfalls from the open-air bath on the right. The view seems to be popular here. Negative ion from the waterfall doubles the relaxing effect! Depending on the season you visit you can take a bath while watching cherry blossoms or autumn leaves. You will not get bored of it no matter how many times you visit. Relaxed all day, in these gentle hot springs! There are two places inside and outside of the hall, that can be used as a resting place. The interior room has a sofa that you can sit on. The view from the window is good, and if you are lucky you may be able to observe wild birds flying into the pond. 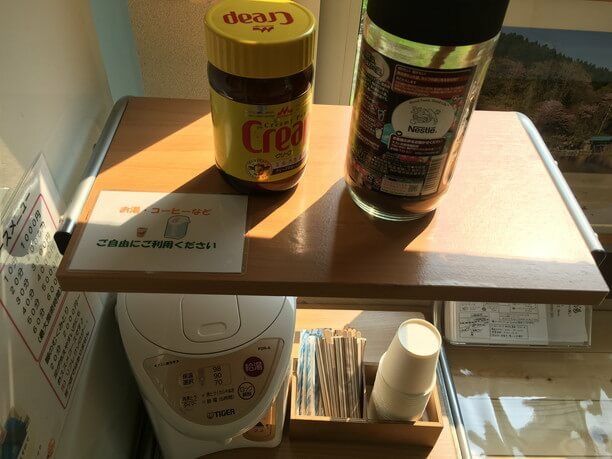 There is also a vending machine, and cold water and instant coffee are prepared free of charge. It is a pleasant service of hospitality. Also, for a limited time on Thursday, they sell baked goods from the popular restaurant “Bakery kimikage located in the neighborhood. 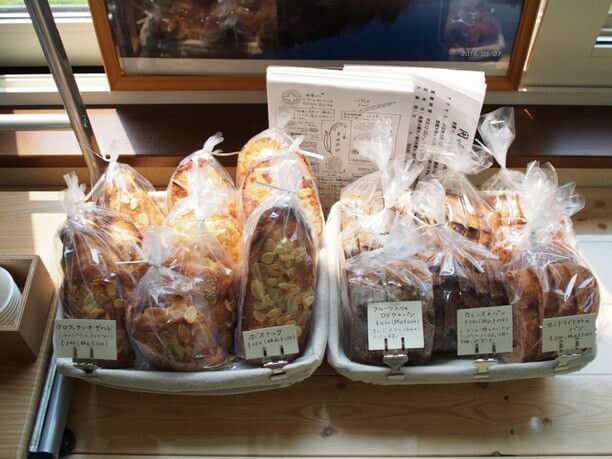 The owner trained at Otaru’s famous shop Eviv, and bakes in a firewood kiln using homemade yeast. his sticking croissants and fruit pies are exquisite! There are also many people who come with a lunch box. 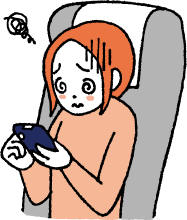 It is best to take a rest after taking a bath and then bathe again. Also, chiropractic care is offered on Sundays and holidays in a remote rest area. 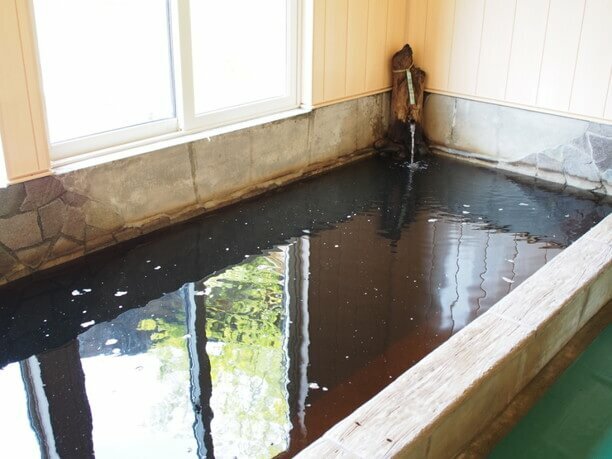 It is a popular treatment that goes well with hot spring bathing. 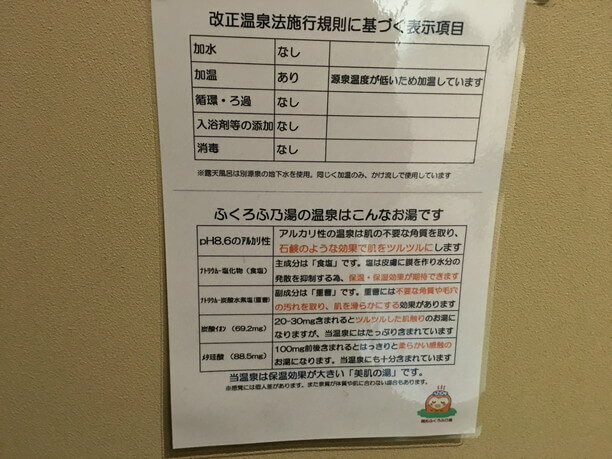 (10 minutes from 1,000 yen) No reservation is necessary, so feel free to stop in after bathing. These hot springs are good for the body and the mind! Also pay attention as you leave. there are local pesticide-free vegetables lined up at the entrance. A farmer from the local vicinity brings them. 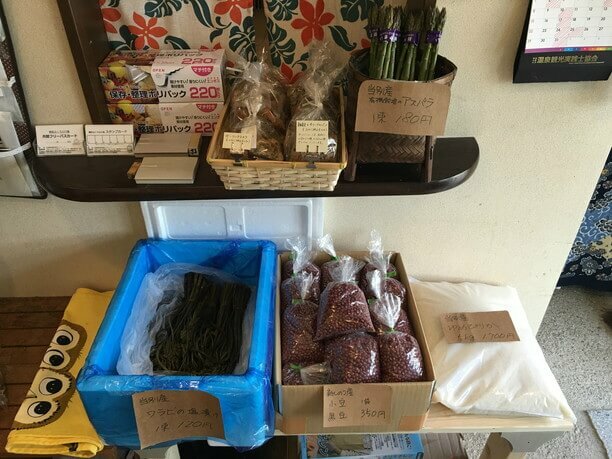 There are various kinds of vegetables, depending on the season. There are also people who are coming just for this,” says Takano. It is delightful to be able to buy local seasonal vegetables at reasonable prices! Mr. Takano feels that everyone is equally comfortable being naked when entering a hot spring, regardless of their status. They even deal with the deaf people by writing with the iPad. It’s not only the hot water, but the fact that they are very kind to people that makes “Kaitaku Fukurofu no Yu ” so popular. If you would like to know the bathing method and quality of spring that suits your constitution, please consult with us. Mr. Takano who has many hot spring qualifications will advise us carefully. Those who are planning to go by JR are OK even if they arrive before the business opens. 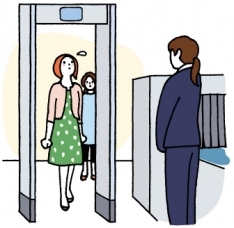 You can call out to Mr. Takano, or you can wait in the rest area until they open. There is no meal offering at the springs, the closest lunch spot is located 1.25mils away by car. There is a very popular handmade noodle shop "Kabato noodle Place." They often get large queues outside the store, so it is recommended to get there even before the opening. 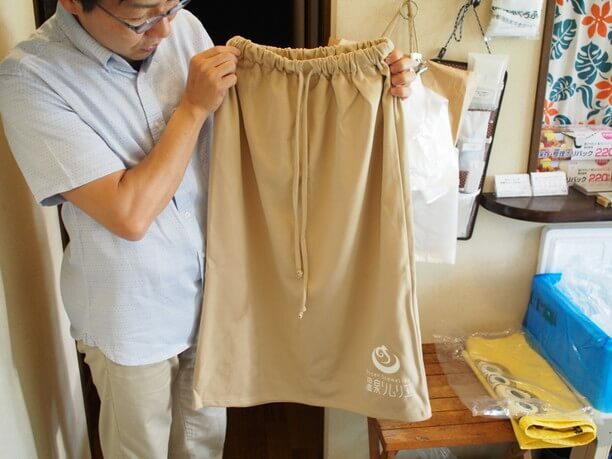 Even if you forget the towel, no worries, they have towels on sale (200 yen). If you forget the shampoo, you can say that you saw this article on J-TRIP, then they will lend you shampoo. 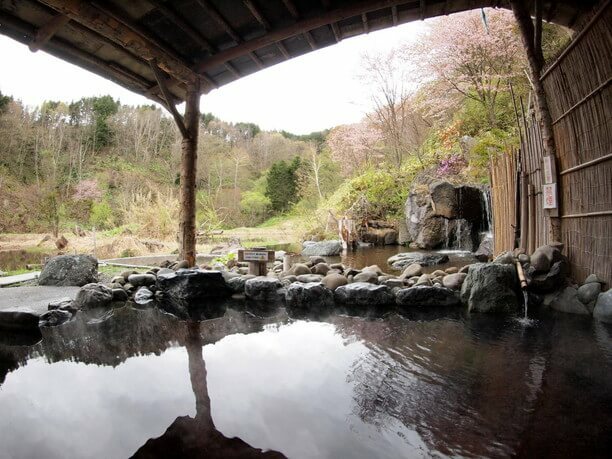 Enjoy a bit of paradise at the Yachigashira hot springs located at the end of the tram route! Yu no Kawa hot springs is a relaxing place for people and occasionally monkeys! 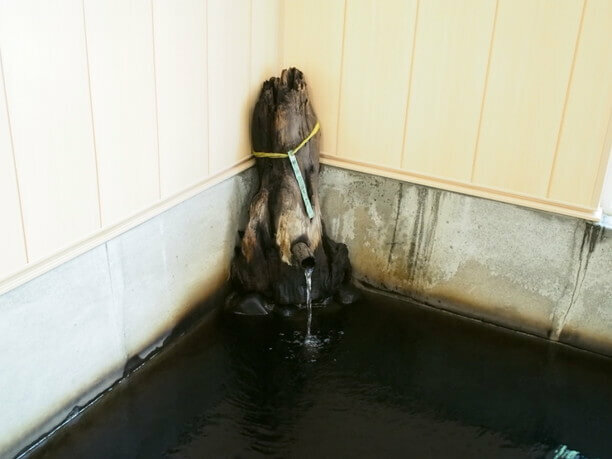 The moru sen fountain at the Tokachigawa Onsen makes your skin slippery!